A USC study that tracked Southern California children over a 20-year period has found they now have significantly fewer respiratory symptoms as a result of improved air quality. The finding expands on the landmark USC Children’s Health Study, which a year ago reported that kids’ lungs had grown stronger over the past 20 years as pollution levels in the Los Angeles Basin declined. In the current study, USC researchers examined a health issue that makes many parents anxious while pulling at their pocketbooks: bronchitic symptoms that could land otherwise healthy children in a doctor’s office or hospital. To assess respiratory symptoms, USC scientists studied children in eight California communities and defined bronchitic symptoms over the preceding year as a daily cough for at least three consecutive months, congestion or phlegm not related to a cold, or inflammation of the mucous membranes, according to Kiros Berhane, lead author and a professor of preventive medicine at the Keck School of Medicine of USC. The study, published April 12 in the Journal of the American Medical Association, followed 4,602 children in three cohorts as they aged from 5 to 18. During 1993 to 2012, children and their parents from Long Beach, San Dimas, Upland, Riverside, Mira Loma, Lake Elsinore, Alpine and Santa Maria answered questionnaires about children’s health. Air quality was continuously monitored in each community. Because bronchitic symptoms are usually about four times higher in children with asthma, the scientists examined associations of air pollution reduction with bronchitic symptoms separately for kids with and without asthma. Researchers also adjusted their analyses for age, gender, race or ethnicity, secondhand tobacco smoke and presence of cockroaches in the home. “It is important to note that while reductions in bronchitic symptoms were larger in children with asthma, they were still substantial and significant in children without asthma as well — indicating that all children have benefited from the improvement in air quality over the past 20 years,” Berhane said. The study found that tiny particles called particulate matter 2.5 (PM 2.5) — which can penetrate deep into lungs and cause serious health problems — dropped by 47 percent from 1992 to 2011 in the study region. USC researchers were able to associate cleaner air with improved children’s respiratory health. 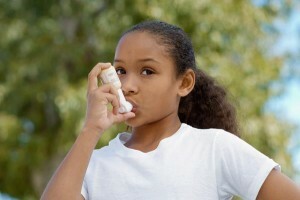 Kids with asthma were 32 percent less likely to suffer from bronchitic symptoms, and children without asthma experienced a 21 percent reduction in these respiratory problems. Moreover, nitrogen dioxide, which can reduce resistance to respiratory infections, decreased by 49 percent in the same two decades. USC researchers linked the drop in nitrogen dioxide with a 21 percent decrease of bronchitic symptoms in children with asthma and a 16 percent decline of bronchitic symptoms in kids without asthma. “This type of data is important for policymaking and for how clinicians would advise their patients,” Berhane said. About 1 in 10 children in the United States had asthma in 2009, according to the Centers for Disease Control and Prevention. Medical expenses associated with asthma amounted to $50.1 billion in 2007 and cost the nation about $3,300 per person each year. Asthma is the cause for almost 2 million emergency room visits each year, according to the Asthma and Allergy Foundation of America. Each year, this respiratory condition is the reason for more than 14 million doctor visits and about 439,000 hospital stays. Frank Gilliland, senior author and a professor of preventive medicine at Keck Medicine of USC, said the USC Children’s Health Study is a unique examination because it has been able to follow children for so many years. California cities have consistently topped the American Lung Association’s annual list of most polluted cities by ozone or particulate matter pollution. Historically, Southern California has reported high levels of ambient air pollution because of emissions from vehicles, industrial sources and two of the nation’s largest ports. Some California regulatory policies that have been implemented include the Low-Emission Vehicle Program, a risk-reduction plan for diesel-fueled engines and vehicles, and pollution controls at the ports of Los Angeles and Long Beach. For many years, environmental epidemiologists have reported adverse health effects associated with increasingly polluted air. So the ability to report that Southern California has been on the path to cleaner air and that this reduction in air pollution has led to significant improvement in children’s health is a welcome change, Gilliland said. USC strives to conduct research that could have a global impact. This study was supported by the National Institute of Environmental Health Sciences, the Health Effects Institute and the California Air Resources Board.